Here's an interactive search map with Active & Coming Soon MLS listings of Homes for Sale in Bradfield Village. Call Jim at (512) 913-1557 for an appointment or with a question. Neighborhood Location: The Bradfield Village neighborhood can be found on the south side of Main Street in Buda. Head west from IH-35 on Main St. toward Downtown Buda, then turn left at the entrance sign at Bradfield Dr.
Scroll down to see more info on Bradfield Village. The data in the following table presents a snapshot of Bradfield Village real estate activity over the past 8 years. Bradfield Village real estate market data is from the Austin Board of Realtors 1/1/2011-12/31/2018. The homes in Bradfield Village were built in the years 1999-2002 by two builders: Capital Pacific Homes and Clark Wilson Homes. The neighborhood has a total of 208 single-family homes in it. The price of homes sold in Bradfield Village increased in 2017. These homes were built in sizes ranging from 1,345 to 2,863 sq. ft. of living space. They provide homebuyers looking for a single- or two-story home a number of options for starting their lives in a new location. Often, they have been updated through the years with some of the options that today's homebuyers most want. Most of the lots in Bradfield Village are typical subdivision-size lots (0.15-0.20 acres), but some are situated on almost a quarter of an acre. An "unusual" feature of a number of the homes in Bradfield Village is the portico (porte-cochère), often with a room above it, that leads to a rear, detached 2-car garage. Some of the homes with this "covered parking" feature are 1-story homes. There are no neighborhood amenities for the residents of Bradfield Village, such as a community pool. 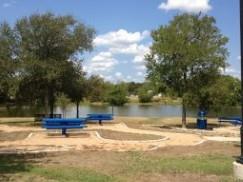 However, the neighborhood is built adjacent to the City of Buda's Bradfield Park. This park features play and picnic facilities, walking and recreation areas, and a small lake that adds beauty to the neighborhood. There is also a large open area in the neighborhood that features a lovely gazebo. 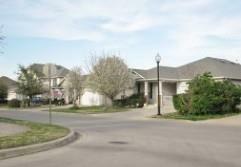 The Bradfield Village neighborhood is part of the growing community of Buda. Since its development in the years 1999-2002, many shopping and other features have been added. Downtown Buda and its "old-town" charm are just west of Bradfield Village. Just to the east in the areas that have been developed along IH-35 there are stores like a super WalMart and an HEB grocery, a number of eating establishments (Logan's Roadhouse, Cracker Barrel, and Chili's, for example), and one of the most popular area sites: Cabela's (outdoor sporting equipment). Buda also sports a number of public parks. Seton Hospital, along with other shopping (Lowe's, Home Depot, e.g.) and eating venues, is located just to the south of Buda in the Kyle area. Golfers have a number of options available in the SSW Austin (Grey Rock GC, Roy Kizer and Jimmy Clay--City of Austin courses) and Kyle area (Plum Creek GC). Homeowners are required to maintain an active membership in the Bradfield Village HOA. Fees take care of common area maintenance in the neighborhood. 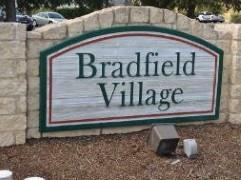 The tax rate in Bradfield Village changes yearly. The primary taxing authorities for the Bradfield Village are the City of Buda, Hays County, Hays CISD and the Austin Community College. Students living in the homes in Bradfield Village attend schools operated by the Hays Consolidated Independent School District. Please confirm the currently assigned school attendance zones with Hays CISD, since attendance zones are occasionally adjusted.